I am currently helping to research the ancestry of Dame Angela Lansbury for an event NEHGS will hold in November, and part of my work is focused on the theatrical tradition in the family of Miss Lansbury’s mother, Moyna Macgill (1895–1975). Miss Macgill’s career spanned the almost fifty years between 1918 and 1965, but it’s worth noting that at least one of her great-uncles and several of her father’s first cousins preceded her on the London and New York stage, while two of Miss Macgill’s brothers, all four of her children, and assorted descendants and in-laws (including Sir Peter Ustinov and Ally Sheedy) continued in the field. As I’ve mentioned in some of my blog posts, one of my research interests is old photographs, whether of my own family or as part of an aesthetic appreciation of the form. I have a growing collection of photographs from (what we now call) the “Golden Age of Hollywood”: roughly the period between 1920 and 1950. 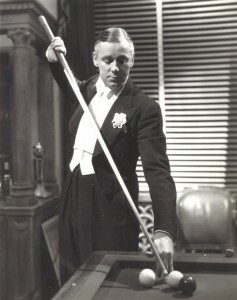 The collection includes at least one actor known to have worked with Moyna Macgill: Herbert Marshall (1890–1966), who appeared in two plays in London with Miss Macgill during the 1920s. There can be an alchemy between sitter and photographer, and I have bought many of these pictures as much to have an example of the photographer’s work as for the star subject. One of the photographers whose work I covet is Eugene Robert Richee (1896–1972), whose iconic photograph of Louise Brooks – dressed in black against a black background, her raven hair geometrically bobbed, lit by a long strand of pearls and her own pale face – is one of the most famous images ever taken in Hollywood. I have other photographs by Richee, photos with the sitter identified and (sometimes) the name of the film for which the still was created, but the greatest mystery in my collection is this one, of an unidentified woman taken when Richee was the chief stills photographer at Warner Brothers. Is it, as I first thought, a photograph of Lucille Ball (1911–1989)? Is it, instead, a photo of her best friend Ann Sothern (1909–2001)? I don’t think either actress was at Warner’s in this period, while both were at MGM, where Richee joined them later in the 1940s. It’s a curious artifact, to my eyes, since Richee was the top man in the department – why is this attractive woman wearing so casual a dress with such splendid headgear? Is it a costume test? For which part of the costume – the dress? the hat and veil? Both Miss Ball and Miss Sothern were top stars of the period, which is fitting, and yet the faint stamp on the back identifies only the studio (Warner) and the photographer (Richee). I suspect that, as so often, the sitter’s identity was no mystery to contemporaries: what had to be included was information about the origin of the image and its maker. Does she seem familiar to any Vita Brevis reader? Interesting! Oddly enough, I just bought a picture of Miss de Havilland (the only living sitter in the collection), and I don’t think it could be her. Why couldn’t it be Olivia? I would say the shape of the face is different. Surely computer facial recognition would be helpful as there are many stars’ photos of the time to compare to. At the very least it would help to rule out contenders. She does not look quite like the two suggested so far. I see what you mean — and she was at Warner Bros. in the right period. 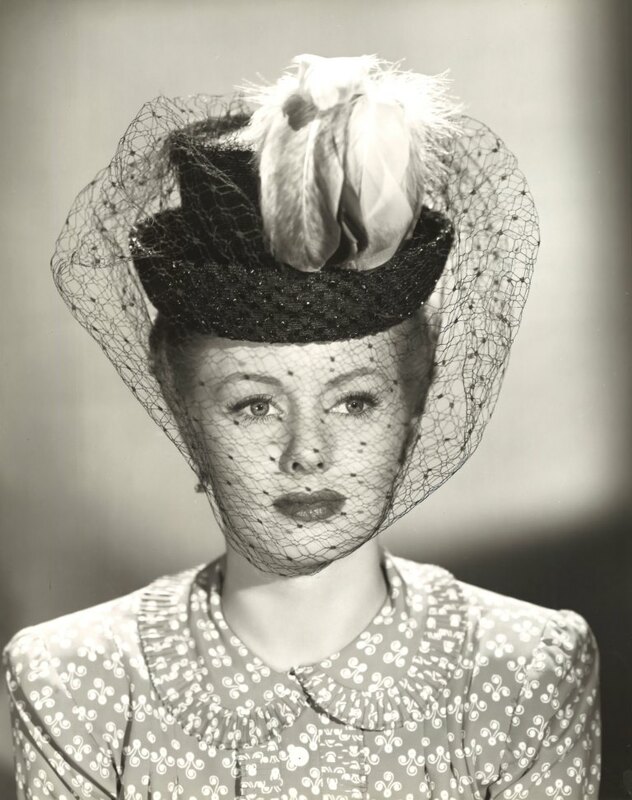 When I first saw the picture I immediately thought of Ann Southern, and then thought of Lucille Ball…. they both had the same basic marking and set lines of their faces… I would still go more along the lines of Ann Southern. I did not think of Olivia at all, but my memories of Ann seem to fit with that picture. Certainly doesn’t look, at least to me, like Lucille Ball in her early days. It does more look like Olivia de Haviland or Ann Sheridan. Ann Southern’s nose is too long. My first thought was Lucille Ball, but on second look, maybe not. Send the photo to Johannes Tromp, innkeeper at Kilburnie Inn ( terrific bed and breakfast place in Lancaster, SC – web site: http://www.Kilburnie.com). He was for a number of years Lucille Ball’s personal chef and I’ll bet he can tell you yes or no re whether it is her. My immediate thought was Lucille Ball. I don’t remember Ann Southern that well–I watched “I Love Lucy” all the time as a kid. If it is Lucille, maybe another reason for the dress/hat discrepancy is that in the TV show, she was usually wearing casual housedresses, like this one. Perhaps for some reason, Richee was playing around with a fancy hat. It could even have been for a prop for something funny for that show. That still doesn’t explain the lack of a name on the back. I do agree that with all the thousands of pictures out there of Hollywood royalty, facial recognition software is probably the best way of solving this, and other similar identification problems. Before I read the text, my first thought was “Loretta Young !”. Of course, Loretta was primarily MGM and I find only one Warner’s related reference for her in 1930. Nonetheless – the eyes, nose, mouth, cheekbones – she should be on your short list for facial recognition comparisons. If the going gets rough, how about researching Warner Bros. films and corresponding costume/hat designers at the time; then, searching their files? Interesting sleuthing job. My first reaction was Joan Fontaine or perhaps her sister Olivia de Havilland. Both were actresses during that time period. Very interesting puzzle, not unlike many of us who have had photographs passed down through the generations, but with no one left to tell us who the subject was! As an aside, many people thought my late mother bore a striking resemblance to Angela Lansbury; one neighbor of mine used to refer to Mom as “Murder, She Wrote”! Could it be a young Barbara Stanwick? My first reaction was Ginger Rogers. Not Ann Sheridan. 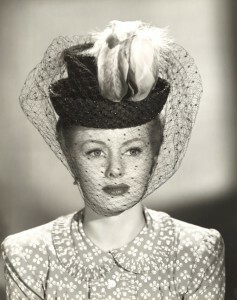 I think Lucille Ball. I put this photo on my Twitter account and it was determined to be actress Joan Lorring. I don’t know how to send the comparison photos to this site. Joan photographs differently in her pics. A similar pose was positioned next to the mystery-girl photo. The comparison to Lucille Ball ( which was the closest guess ) fell short due to the distance between the eyes and the bridge of the nose. Also, Lucy did not work at Warner Bros. until 1963. It is definitely not Ginger Rogers, Ann Sothern or Olivia De Havilland. The question remained whether she was a relative unknown. Joan matched on several points.